We invite you to join Brand g Vacations for an all-inclusive, all-LGBT journey, featuring the Temples of Angkor Wat and the mighty Mekong River. The fares above are per person USD. Initial deposit is $850 person, with final payment due September 5, 2018. Cruise Port Charges of $180 per person are additional. Pre-paid gratuities of $250 per person are additional. Reduced single supplement of $2500 applies to single occupancy bookings in Signature, Vista and Superior Suites (Grande and Prestige 100% single supplement applies). International airfare is not included. All reservations are subject to Brand g's Terms and Conditions. There can be no more striking cultural contrast than tranquil Cambodia and bustling Vietnam. From the diverse countryside of Cambodia to the Mekong Delta, so rich in human life and endeavor, you’ll discover two countries, two cultures, and two ways of life linked by one river, the Mekong. Join Brand g on a comprehensive 12-night journey through the heart of Cambodia and Vietnam, featuring a seven-night all-gay cruise charter along the mighty Mekong River. 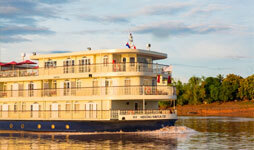 Cruise aboard the all-suite, luxurious Mekong Navigator, specially constructed to ply the Mekong River from fabled Siem Reap, Cambodia to Ho Chi Minh City. Embracing an elegant French-colonial design similar to the many homes that once lined the streets of old Saigon, she boasts spacious suites from 258 square feet up to an expansive 584 square feet in size. From here, you will enjoy all the wonders the Mekong has to offer in a sophisticated, yet comfortable style. With never more than 22 guests per expert guide, you will enjoy enriching lectures, a comprehensive series of well-planned excursions, and most meals and beverages! Also included is a three-night stay in Siem Reap including an in-depth visit to the UNESCO World Heritage site of Angkor Wat, and a two-night stay in bustling Ho Chi Minh City (formerly Saigon), and each featuring five-star, centrally located hotels. You’ll also enjoy complimentary beverages, locally produced beer, alcoholic beverages, soft drinks as well as house wines with dinner. Dine on European cuisine and regional specialties infused with flavors from Asia’s celebrated culinary tradition. With just 34 custom-designed suites, space is limited, so contact your travel professional or Brand g Vacations today! 3 nights deluxe hotel accommodations in Siem Reap, including daily breakfast, two lunches and one dinner. 7 night cruise including all meals. 2 nights deluxe hotel accommodations in Ho Chi Minh City, including daily breakfast, one lunch and one dinner. Cruise includes free-flowing local spirits, house wines (wines with dinner only) and locally produced beer and soft drinks. Visit the 12th century Angkorian temple complex of Wat Nokor Bachey. Glide in wooden sampans to the historic An Kiet House and gardens in Cai Be, Vietnam. Ride a Vietnamese tuk-tuk, or xe loi, to a family-owned mat weaving workshop. Take a cyclo tour of Phnom Penh, including the Royal Palace, Throne Hall, Moonlight Pavilion, and the National Museum collection of Angkorian artifacts. See Phnom Penh’s famous Silver Pagoda, home of Cambodia’s Emerald Buddha and the diamond-encrusted Maitreya Buddha. Travel to Choeung Ek and see the Khmer Rouge Killing Fields, the memorial stupa, and Tuol Sleng (S-21 Prison). Tour a local school in the village of Wat Hanchey and receive a traditional Buddhist water blessing from the monks at the local monastery. See Kampong Cham’s Phnom Pros (Man Hill), Phnom Srei (Woman Hill), the 33-foot long reclining Buddha, and the 42-foot tall preaching Buddha.